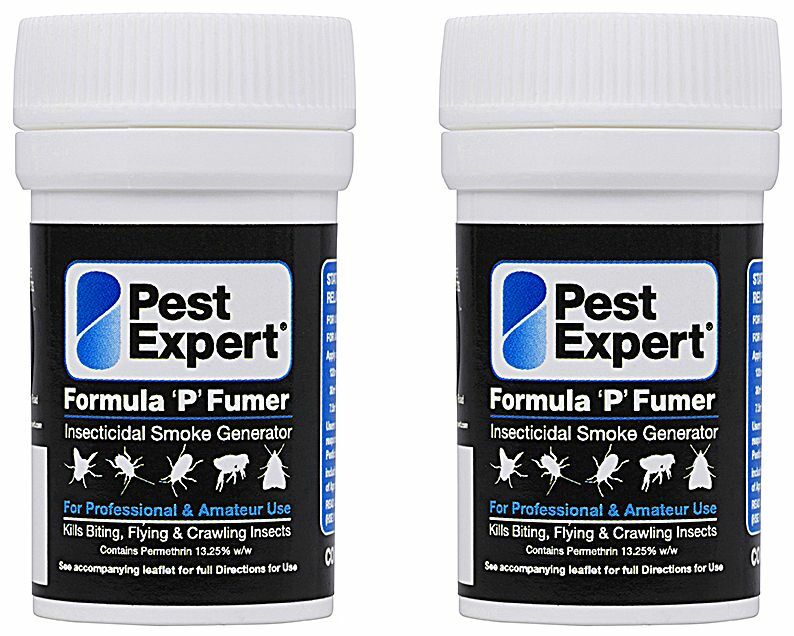 Pest Expert Formula 'P' Fumers are cockroach smoke bombs for fumigating cockroach infestations. Once lit, they release a smoke which can penetrate into cracks and crevices to kill cockroaches harbouring there. Formula 'P' Fumers contain the powerful cockroach killing insecticide permethrin (13.25% w/w). Each 3.5g Fumer will treat an area of approx 7.5 cubic m, so you will need to use 4 Fumers (2 Twinpacks) for an average-sized bedroom of approx 4m x 4m. 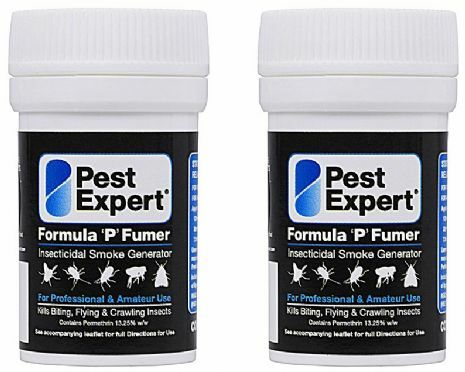 As there is no long-lasting effect once the smoke has dispersed, we recommend use alongside residual insecticides such as Pest Expert Formula 'C+' Cockroach Spray and Formula 'P' Cockroach Powder. Consider how many fumers you need for the room to be treated. Heavy infestations may require more than one application. Clear people and animals including fish from the room before use. Place canister(s) spaced out on the floor surface on a heat resistant surface e.g. a plate on top of a sheet of aluminium foil 50cm x 50cm. IMPORTANT: THIS PRODUCT MAY EMIT SOME SPARKS UPON IGNITION. CAUTION MUST BE TAKEN WHEN LIGHTING THE PRODUCT. Make the area to be fumigated as smoke tight as possible by closing all windows etc. Open canister(s) and light the fuse on the canister furthest from your exit point first, then light the next fumer and move towards your exit point. Close the door on exit, it is not necessary to seal the door with tape. Leave for at least 2 hours but preferably overnight and then ventilate the room thoroughly. For severe infestations fumigate 3 times at 5 to 7 day intervals. Vacate treatment area before application. Cover food, food preparing equipment and eating utensils before application. Remove or cover all foodstuffs before application. Do not apply to surfaces on which food or feed is stored, prepared or eaten. Remove or cover fish tanks and bowls before application. Keep in a safe place away from children and sources of ignition. Dispose of used generator safely. Read all precautions before use. For use only as an insecticide. THIS PRODUCT MUST NOT BE USED AGAINST HOUSEFLIES IN INTENSIVE OR CONTROLLED ENVIROMENT ANIMAL HOUSES BECAUSE IT IS LIKELY TO CAUSE CONTROL FAILURE DUE TO INSECTICIDE RESISTANCE. Ventilate areas thoroughly after application. Wash hands and exposed skin before meals and after use. This product is approved under the control of pesticides regulation 1986 (as amended) for use as directed HSE No: 9233. I did rate 5 stars due to the costumers service which excellent also for efficacy of the product bought and quick delivery.